The perfect style of yoga for modern humans who spend a lot of time sitting. Most people are aware of the benefits of practicing yoga. But many office dwellers are hesitant to try it because of their body size or lack of flexibility. Those that do may find the class uncomfortably hot or too aggressive for their wrists, knees, or previous injuries. Good news. There’s a style of yoga specifically designed for people who sit a lot, whether at a desk, during a commute, or on the couch. Better yet, it’s accessible regardless of physical fitness level. It’s called yin yoga and you’ve probably never heard of it. Lacking the flourish and athleticism of other styles of yoga, yin poses don’t make for inspiring photos. They are practiced seated and laying down, using a generous number of props like blankets, yoga blocks, bolsters, and pillows. Yin yoga was originally developed to help the ancient yogis get ready for their lengthy seated meditation practices. They were aware that sitting is actually quite hard on the body and thus required preparation. The purpose of yin is to condition the body’s connective tissues, namely fascia. Fascia is the tissue that covers your muscles and internal organs. It provides support and binds them together and its smooth, slippery nature allows for movement. It is a large, layered, connected web stretching from your head to your toes, from your skin to your bones and everywhere in between. Perhaps you’ve never thought about your fascia before. (Unless you suffer from the fairly common plantar fasciitis — a inflammation of the fascia in the feet.) But you’ve definitely experienced some of the consequences of ignoring it. Your fascia has more nerve endings than your muscles and is why you sometime feel referred pain. What you might describe as muscular pain (e.g., sore hamstrings) is often actually pain in the fascia. Tight fascia can be mistaken for tight muscles. Fascia can get stiff and sticky if you are too sedentary. It can get bound up or twisted if you are overly active or do repetitive movements. Enter yin yoga. The way to condition fascia is with gentle pressure or traction held for longer periods of time (e.g., 3 to 5 minutes) and that is exactly what yin yoga delivers. The yin technique is to get into a specific pose, place supports (e.g., yoga blocks, blankets, pillows) between you and the floor as feels good, and then relax everything as much as possible letting gravity and time do the work. You ease into each pose — starting at about 60% of your range — as opposed to using effort to go to your maximum depth. Yin invites you to go far enough into a pose so you feel some sensation, but can still remain relaxed elsewhere in your body. You may feel subtle to intense sensations as your muscles release and the connective tissue is gently conditioned. When it comes time to transition out of a pose, move at a snail’s pace. The slower the better. While there is no physical effort in yin yoga poses, there is a substantial mental element. Sometimes the mind gets bored during the long hold — the stillness of the body makes the mind restless. Or the sensations in the body are intense so the mind wants to escape. Do your best to stay present. Focus on your breath or the sensations you are experiencing. 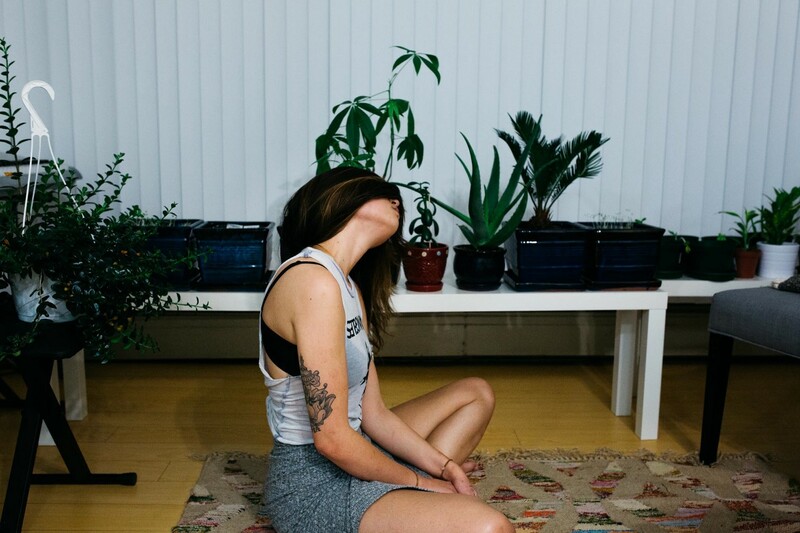 You can try yin yoga in the comfort of your own home. Just gather up some blankets and some pillows. A couple of bath towels can also work well as supplemental props since they are easy to fold or roll to different sizes and shapes. Remember, the more props the better! Put them wherever they feel supportive. Whenever you notice you are using effort to maintain the pose, use more props so you can relax instead. An internet search will reveal a plethora of videos of yin yoga poses. Here are the names of several poses you can search for, along with the body parts they target. Try allocating 20 minutes in the morning to do caterpillar, deer on each leg, broken wing on each arm, and supported fish pose with butterfly legs. See how different you feel the rest of the day.